Ford Focus Estate driven | What Car? There arent nearly as many small family estates on offer as there are small family hatches, but competition for the new Ford Focus Estate will still be fierce. Why? Because it still has rivals such as the Vauxhall Astra and VW Golf Estates to contend with. 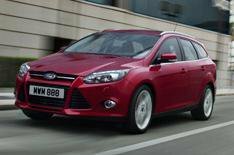 Boot space will be the most important factor for estate car buyers, and compared with its rivals, the Focus does reasonably well. The boot isnt quite as long as it is in the Vauxhall Astra or VW Golf, but its a little deeper and a good deal wider, so youll still be able to cram in plenty of cargo. There are some useful touches, too, like a collection of takeaway hooks and lashing eyes, plus a fabric load cover that retracts when you tap it with a fingertip. Theres even more space to be had when you fold down the rear seats. Yes, you have to lift the rear seat bases out of the way first, and then drop the backrests in behind, but it does give you a perfectly flat load area. The folded seat bases do rob some length from the extended boot, though. Elsewhere in the cabin, things are pretty much the same as in the hatchback. Theres a little more headroom in the back, but rear leg- and shoulder room are the same. Theres enough room for three small children or two large adults. Theres bags of space up front. The front also has the same spot-on driving position and usable dash layout as the hatchback, and it also has similar quality. The top of the dash has a nice soft-touch covering, but a few other panels feel a little cheap, so its not as classy as a Golf. You hear a little more road noise than you do in the hatchback, because the estate only has a sliver of fabric to separate you from the sound made by the rear wheels rather than a solid parcel shelf. Plus, the estates extra weight means that the engine has to work a bit harder than it does in the hatch. You still get an impressive amount of pace to work with, though. Otherwise, the hatchbacks superb driving manners are preserved. Strong grip, taut body control and responsive steering make the Focus Estate fun in corners, and while the low-speed ride might prove a little lumpy for some tastes, things become much smoother at higher speeds. Want to see what else is available? Here are the Ford's closest rivals. Theres not much to separate the Focus estate from its rivals on space, and pricing is much-of-a-muchness between the three as well. That means your buying decision will probably come down to what sort of character you want from your car. The Focus is the one to go for if you enjoy your driving, because its the most fun car in the class. However, if its comfort or a more classy cabin youre after, the Astra and Golf do it slightly better. If youre looking for the most boot space for as little money as possible, then its none of the above. The Skoda Octavia Estate is bigger than all of them, and costs considerably less.